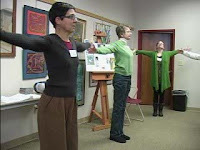 The three-part Winter Wellness Series, hosted by the YS Library, will air on the Yellow Springs Community Access station (Channel 5). Part 1, "Movement and the Arts," will air Friday, Jan. 28 and Friday, Feb. 4, at 4 and 8 a.m., noon, 4 and 8 p.m. with Parts 2 and 3 airing in February. For three Saturdays in January, program presenters Carmen Milano, RYT, and Kristen Andreae, RN, LAc, led participants through a lively, interactive and educational exchange of health and wellness information. To see the full station schedule, look on the right column of this blog, scroll down past "Email the Blog" and look for the subhead: Calendars/Schedules. Click on the link for Channel 5 -- YS Community Access.